Home / airasia / airlines / asia / issues / AirAsia's deliberately complicated refund process! AirAsia's deliberately complicated refund process! January 2018 update: 11 months and nothing has been done. Air Asia has cancelled Chennai-Bhuvaneshwar flights and I had to undergo this circus one more time. 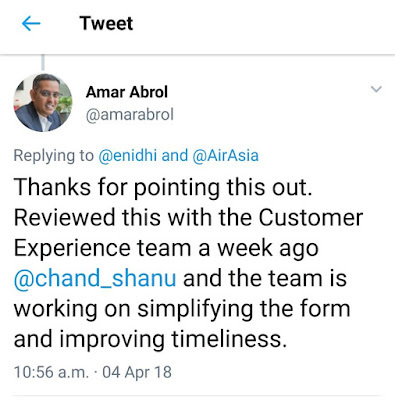 AirAsia India CEO Amar Abrol has responded to my tweet and has promised a review and corrective actions. 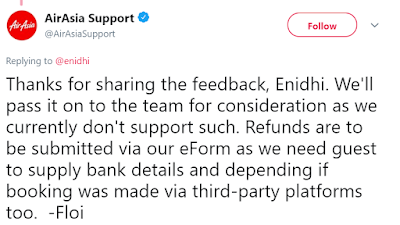 AirAsia support handle has also acknowledged the feedback. Appreciate AirAsia team for acting swiftly and responding. Now will wait for some improvements to materialize. Recently AirAsia cancelled one of their two daily flights between Kuala Lumpur and Yangon Myanmar. It affected my future booking to Yangon. As per the original flight plan, I would be getting 4.5 days at the destination and spending 1.5 days in travel. After the evening flight cancellation, if I have to take morning flight, I will get only about 3.5 days at the destination and have to spend 2 days in travel. This wasn't an exciting proposition so I decided to cancel my ticket and take the money back. However, AirAsia's cancellation process is unnecessarily complicated, deliberately designed such that it discourages customers to cancel or they lose track and forget to follow up so that Airline can keep money longer or keep it forever. Let me show you some samples as to how cancellation works in other airlines. If you've to cancel your Air Vistara booking, how do you do it? You click on a button next to the booking. If you've to cancel your booking on Jet Airways, how do you go about it? You click a button next to the booking. Now let us see how AirAsia's cancellation process works. 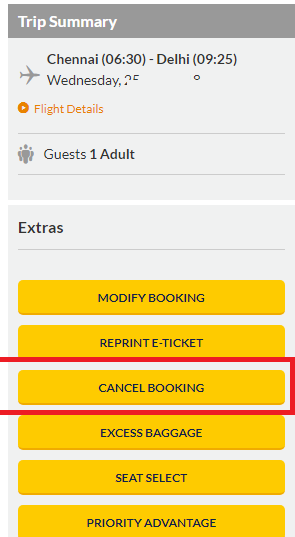 There is no cancel button in the website next to each booking. There is a modify button, but that is only to spend more money- to select seat, buy meals, baggage and stuff like that. There is no cancel option inside anywhere. When AirAsia cancels a flight and customers chose to cancel their tickets, they need to fill below complicated form- each of this could have been easily populated from booking details above, if they'd given a link for cancellation right there, but NO. AirAsia wants to make ticket cancellation as complicated as possible for the customers. After submitting this form user has to wait for several days to know the results. If any one info is wrong, Air Asia will simply reject the request- there is no option to edit and resubmit, they won't call you to ask for clarification. Customer has to re-submit all the fields one more time and repeat the waiting process. 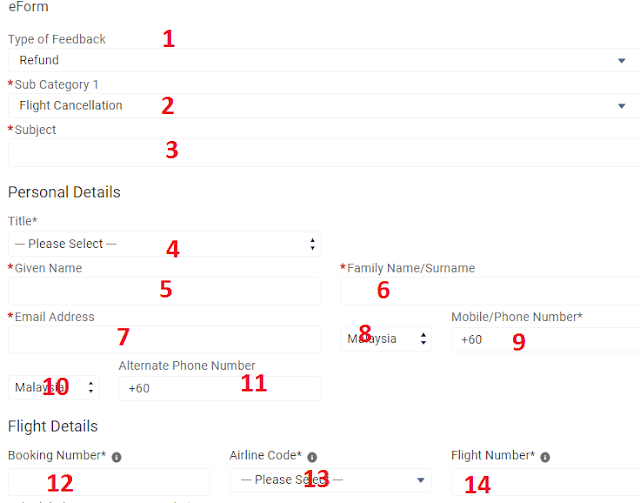 The e-Form has 30+ fields/clicks a customer needs to fill- most of it is readily available in the booking system but AirAsia wants customers to suffer as much as possible as they are asking their money back. I can understand bank details may be needed additionally, but most other details should be retrieved from Booking reference. I was also advised by customer care to attach screenshots of email announcing flight cancellation (as if AirAsia doesn't know and I have to prove it to them again that they have cancelled their flight and it is affecting my booking). A PNR can have 4 to 6 flights- it is not clear which flight detail should be entered above- the first one or the one that is cancelled. If they don't like what you've entered, customers will have the joy of re-submitting everything again. After submitting this form, there is no way to see this submission, track its status or make a correction. An email that you will get is your only reference and hope. If your submission is accepted, Air Asia needs full 58 working days to process your refund. 7 to 10 days is the time most businesses take to process refund. Air Asia needs 6 times that duration- they wish to hold on to your money as long as possible, hope that customers either fail to cancel or forget about their money. AirAsia has discontinued Mumbai flight effective April 27th. Most of the affected customers will now have to go through this complicated ordeal of having to beg their money back through e-forms. Give cancel option right inside Manage My Booking-avoid forcing customers to refill everything in the e-form one more time. When you've cancelled the flight, it is not fair to waste customer's time unnecessarily. What is the problem to allow call centre staff to accept and process cancellation requests? 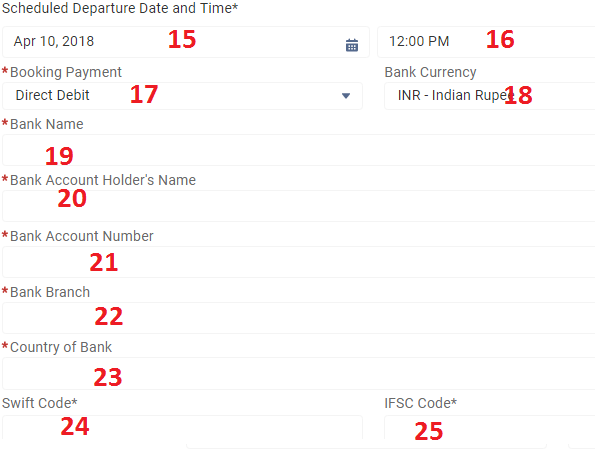 or even if you insist on e-form, just entering PNR (booking ref) should be enough- all other details can be retrieved from booking reference- why force customers to enter dozens of inputs? Don't close a ticket without calling customer and getting his/her consent. It is possible that out of 30+ fields customer might do some mistake in a few fields unknowingly or because of lack of clarity. It is no joy to keep submitting same form again and again. 58 working days is not reasonable. 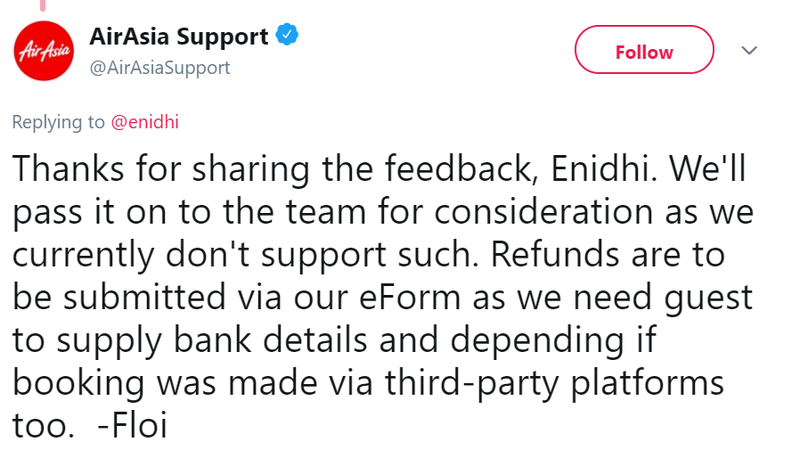 Process refunds within 2-3 weeks max. When a flight is cancelled from Air Asia side, some courtesy like additional compensation will be nice. Mere refund last minute won't help much. Let me know your thoughts...If you've ever cancelled your flight with AirAsia, how many days it took to get the refund? How was your experience? Thanks. AirAsia team has responded and promised corrective action. Let us see. It is sad to see that a company like AirAsia is not that customer friendly when it comes to ease of doing business with them. Have you tried tagging Tony Fernandes on his twitter? If not, do that already. May be that helps! Better still, tag both Tony and Richard Branson! Both have known to be funny and rivals (in F1 Racing years ago) to each other, even though their businesses do not directly compete with each other in every markets (except Australia I guess). 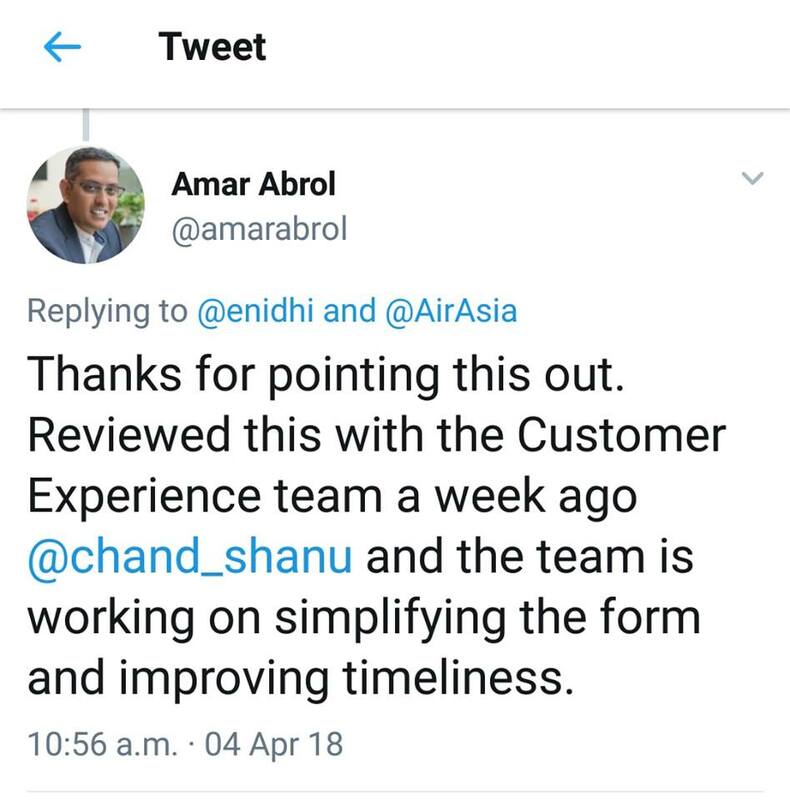 Air Asia India boss and their twitter support has responded and has promised corrective action. Will wait n watch. Don't feel the need to escalate till Tony right now. It is nice they have responded. Hope they will implement the change. Yes. Let us see. This is AirAsia's global website, so I guess RedQ should agree for improvements.